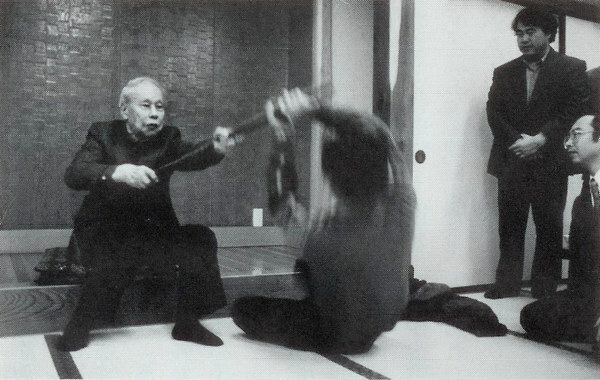 You may recognize Yukiyoshi Sagawa’s student Keisetsu Yoshimaru (吉丸慶雪) in the photo above from the articles “Aiki no Rentai: The Conditioned Body of Yukiyoshi Sagawa” (Part 1 | Part 2), and “Yukiyoshi Sagawa on Bujutsu and Ki-Ryoku” (Part 1 | Part 2). 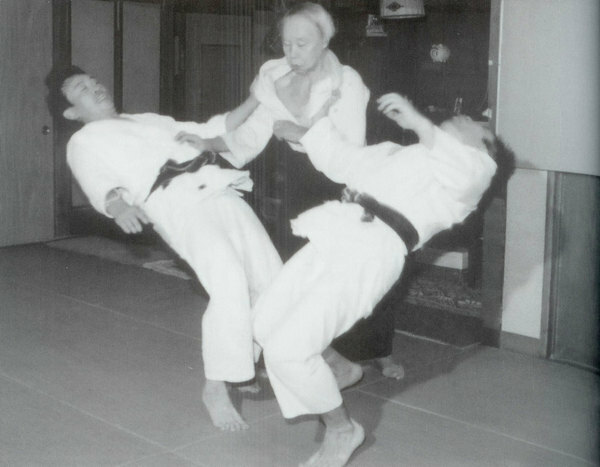 You may also recognize Yoshio Ohara, famous in Sagawa Dojo for his great strength, whose picture appeared in the second part of “What is Aiki?“, being thrown by Yukiyoshi Sagawa in Aiki-nage. Masaru Takahashi (高橋賢) also appears in the commemorative photo above. 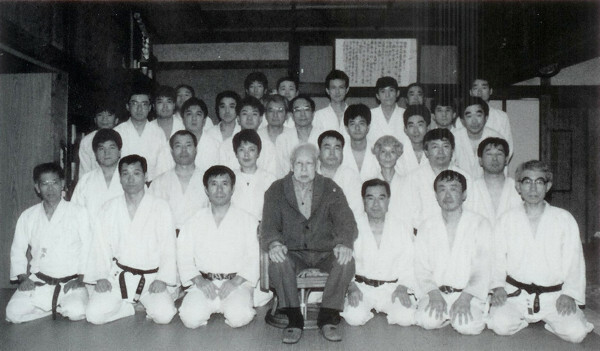 Takahashi sensei was a senior student of the famous Daito-ryu instructor Yukiyoshi Sagawa, and continues to instruct at the Sagawa-den Daito-ryu Aiki Budo Sagamihara branch dojo (佐川伝大東流合氣武道相模原支部) and at the Daito-ryu Sagawa Dojo hombu (大東流佐川道場本部) in Kodaira city. Takahashi sensei often contributes articles on Daito-ryu to the monthly Japanese Budo magazine Hiden (月刊秘伝), and is the author of a book on Chinese Qigong, 中国秘伝の秘伝術気功法, which has been translated into English and published as “Qigong for Health“. This is the third and final section of the English translation of his thoughts concerning the analysis of Aiki. You may wish to read Part 1 and Part 2 before reading this concluding section. The original Japanese text appeared in Takahashi sensei’s book “The Truth of Daito-ryu Aiki” (大東流合気の真実), which was published in Japanese by Fukushodo Co. Ltd. in September 2007. Let’s look at a simple approach to Aiki from a neurophysiological and psychological perspective. Aiki places importance first on the movement of the hands. When one is grasped by the enemy one must gauge their power through the internal senses of the wrists (Sensei expressed this as “Te-no-uchi” / 手の内) – how much power and from what direction the attack has come must be grasped in an instant. As discussed previously, one must analyze both oneself and the opponent anatomically, and while remaining conscious of each individual section of the enemy’s muscular and skeletal structure, instantly work out the point of attack, angle, direction and footwork. The most important sensor used in calculating all of these factors in an instant is the internal senses of the wrists. It is through this sensor of the internal senses of the wrists, the “Te-no-uchi”, that one gauges and then turns to counter attack in an instant. 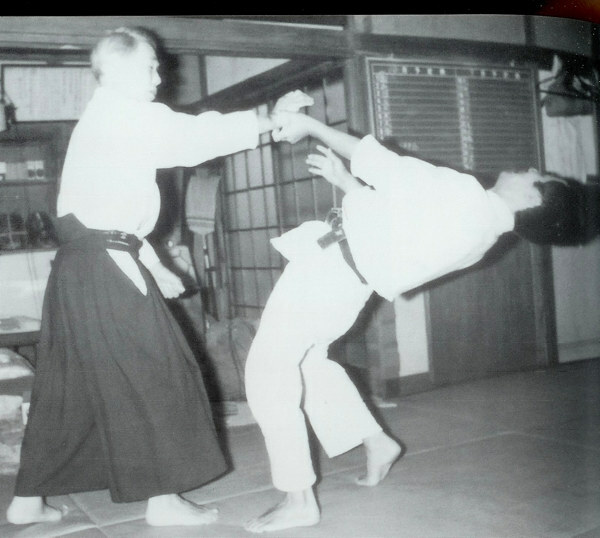 From Sensei’s emphasis on “the Te-no-uchi is important” can be inferred the meaning “It is important to sharpen the inner senses of the body while analyzing the power of the enemy”. When utilizing the “Te-no-uchi” adeptly and effectively, there must be no unnecessary power in the shoulders. It can be said that Sensei’s teachings of “remove power from the shoulders” and “don’t put (unnecessary) power into the hands” are required conditions for refining the internal senses. Let’s explain “don’t put (unnecessary) power into the hands” in a little more detail. For example, in the case of Katate-dori, “power” must be concentrated only in the place on the wrists that is grasped by the enemy. Outside of this area, both above and below on both arms, unnecessary power is not required. This is the meaning of “don’t put (unnecessary) power into the hands”. When considering the concentration of power only in the wrists in terms of physiological anatomy, it is physically impossible to move only the musculature in that area, and the muscle groups around that area carry more tension than necessary. This is associated with wasted energy, and the reason why “Aiki Shuchu-ryoku” (“Concentrated Power of Aiki” / 合気集中力) cannot be transmitted to the opponent. As a first step in concentrating power only in the section of the wrist that has been grasped, “intent and imagery” are important. Sagawa sensei expressed this as “Aiki is intent” (合気は意識だ), but the meaning of this is that it is important to have strong intent in the “Concentration of Aiki” (合気の集中). When expressing power, it is easy to induce a psychological mechanism that seeks to contain that power, and this is the cause of tension in the elbows and shoulders. When this occurs one’s natural power will not be transmitted directly to the opponent. In order to remove unneeded power, it is important to first cast off this “mentality of containment”. The removal of this “mentality of containment” is an important teaching related to “don’t put in power” (力を入れるな). One exercise for removing power from the shoulders and elbows is “Aiki-age” (合気揚げ). 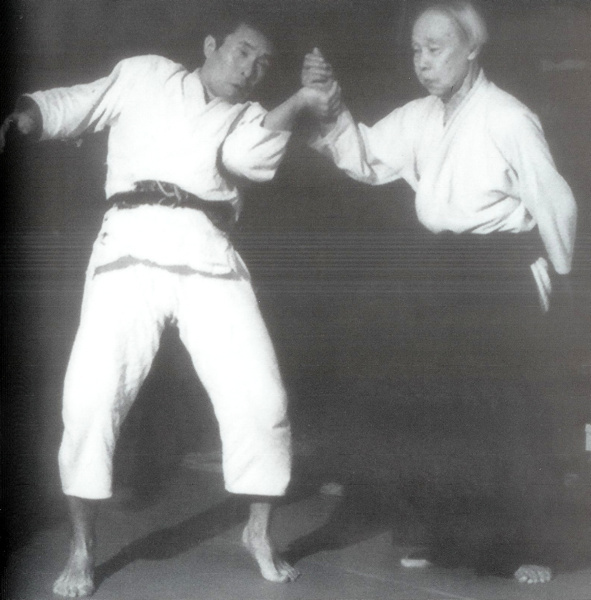 “Aiki-age”, which has the effect of conditioning the “Te-no-uchi”, is an important foundational exercise for producing what Sagawa sensei called “Transparent Power” (透明な力). When compared to the “Transparent Power” that Sagawa sensei used, our power is still at the stage at which it should be called “Muddy Power” (濁った力). “Aiki-age” is a conditioning method that is indispensable for gradually reducing the “muddiness” while increasing “Transparent Power”. Naturally, Sagawa sensei was not able to make free use of “Transparent Power” at first either, and at the beginning must have also had some “muddiness” in his power. The conditioning of weapons arts is effective in making the wrists soft and strong. For example, even in seated techniques, one cannot apply Aiki only through the movement of the hands. The hands are supported by the trunk and the lower body. There are also such teachings as “keep your body straight”, “don’t move your hips” and “put power into your lower abdomen”. Additionally, since the effectiveness of Aiki will vary depending upon the positional relationship of one and one’s enemy, ashi-sabaki (足捌き) and tai-sabaki (体捌き) become important. Sensei’s teachings of “don’t stiffen the knees”, “use your feet lightly” and “use the tips of your toes” are related to tai-sabaki. 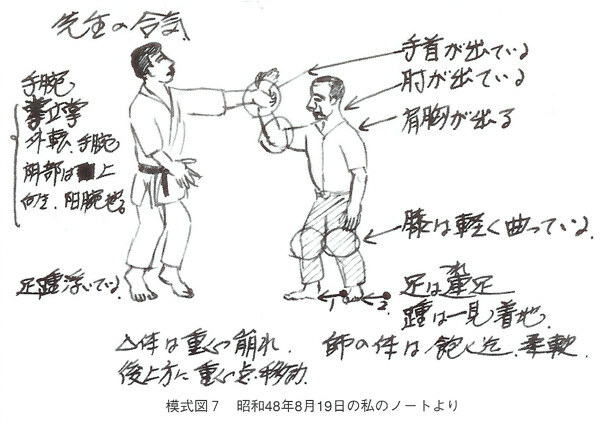 Figure 7 is a rough sketch that I am embarrassed to present – my notes on one example of Katate-dori Aiki that Sensei showed on August 19th of Showa year 48 (1973) using Mr. Yoshimaru as a partner. I drew Sensei’s posture when applying Aiki and the posture of his partner as they were destabilized, and noted what I felt at the time were the secrets of Sensei’s Katate-dori Aiki. You can see many of the basic points that were discussed above. 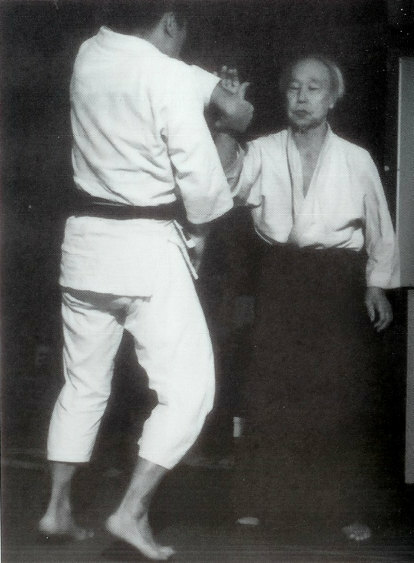 Sagawa sensei’s wrist, elbows, chest and shoulder are forward, knees are lightly bent. The feet are in “Tsure-ashi” (連足), the heels appear to be down. Sensei’s body is completely soft. Because human beings are made of flesh and blood the skeletal structure and the muscles are changing with every second. Consequently, from a physiological perspective one must match with the opponent’s body and respond instantly to their joints and musculature. This is another reason that one must not put unnecessary power into the body. Expressing power carelessly when applying technique will trigger a reflexive defensive reaction in the enemy. When the enemy’s level of wariness is at its highest is when their defensive power becomes the greatest. Therefore, attacking methods are taught that physiologically suppress the enemy’s level of wariness to the lowest possible level and restrain their defensive power. In addition to mechanical principles, what can be thought of as the great principle of the Aiki taught by Sagawa sensei “Use power efficiently to divert the enemy’s power, destabilize and attack” must be analyzed from the aspects of anatomy, biology, neurology and psychology. 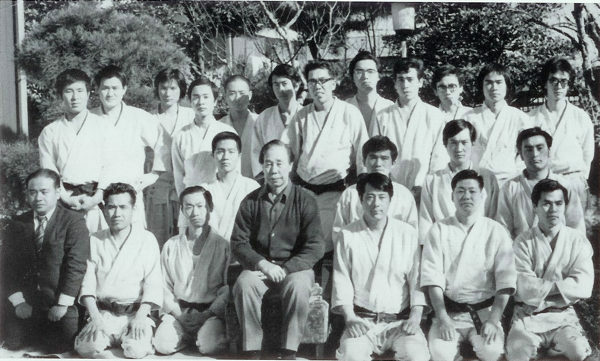 Sensei naturally came to understand these academic elements through numerous experiences of actual combat. While it cannot be denied that Aiki Shugyo is extremely difficult, the individual points of advice given to us by Sagawa sensei are not at all difficult. If one follows the structure of the technical method of Sagawa-den Daito-ryu Aiki Bujutsu (佐川伝大東流合気武術), faithfully learns “Aiki Kyotei” (“The Teachings of Aiki” / 合気教程), and while diligently investigating Sensei’s teachings continuously builds their “Aiki Tanren” (“Aiki Conditioning” / 合気鍛錬), I believe that they will absolutely be able to grasp hold of Aiki. Even if one is not able to realize the level of a master of Aiki, if one makes the effort they will be able to develop each of their individual “natural powers” to the highest possible levels, and will be able to better their mind and body (心身) along the “Way of Aiki” (合気の道) that Sagawa sensei has shown. What has been introduced here are only basic principles. 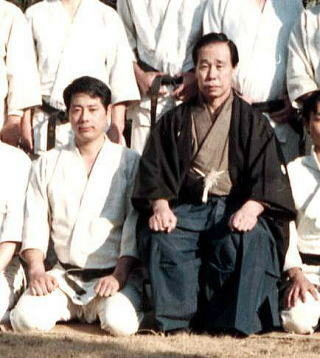 There are any number of other specific secret methods that were taught and practiced by Sensei. It is out of fear that the national treasures of these secret techniques would be lost to the world that I have disclosed even this small portion. Fukushodo Co. Ltd. in September 2007. Good article, Chris, but he said so little. Nice to know that “jin” is Aiki Shuchu-ryoku, but if a reader doesn’t understand or know how to manifest those forces, it’s still out of reach. He didn’t really do a lot to save the national treasures, IMO, but it was fascinating reading his descriptions of what was happening and the perspective he had. I would be really interested to hear Ikeda Sensei’s response to this bit, since he teaches the same thing and he’s developed his own descriptions, etc. A comparison would be nice. Thanks again. Yes, he’s rather vague. I’m sort of torn between thinking that there are things he didn’t get or didn’t understand (I have no idea how much he can actually do, but that’s another discussion), and thinking that he’s deliberately being vague in order to obscure the “secrets”. On the one hand, he does say that Sagawa never explicitly stated what the principles are, which may be part of the problem. On the other hand, the folks out of Sagawa Dojo are notoriously secretive. I was curious if anyone sees a resemblance to Annie Abbott’s feats, and perhaps has considered the possibility of Sokaku Takeda sensei witnessing and then mastering the mechanics behind them. I think they were about the same size too. The “Georgia Magnet”? Rather unlikely, I would think, IMO they were really doing very different things. Thank you for the response Mr. Li. I think Mr. Pranin feels the same way. Yet she was in Kobe back in the days when Takeda sensei was relatively young, and although she never implied a martial element, the exposed principles behind what she did seem to agree with certain unbalancing principles of Daito Ryu. Also, I read that Takeda sensei was involved in circus activities. Is that not correct? He was involved with a performing troupe, sometime in the 1870’s, I think. Personally, I don’t see much similarity of principle, but there’s no way to disprove a meeting at this point. Having looked her up just now, I agree with you that there are similarities. The techniques are natural and could have been developed independently, though. Anyway, I bought an e-book on the subject on Google Play: “Body Magic” by John Fisher, and I look forward to reading git. It seems that even magicians are less secretive than Aiki-jujutsu masters! Being one of those budo bums who tends to appear at multiple style seminars, I’m intrigued by the use of the term “tenouchi”. Any insight on his meaning with this given the context? I ask as a non-Japanese speaker who has heard various slightly different meanings given to the term depending on context. One is the wringing action on the tsuka of a sword. Another is simply the positioning in the hand (meaning inside of the hand). Another is to simply talk about the palm (which might really mean the second one I already mentioned). I can also imagine the idea of an active “connection” feeling that can be generated by the “feeling” of the slight wringing action, or what others might want to call “extending ki” depending on your lineage. Anyway, great article and thanks for the translation as always. Thanks Keith! I’ve heard all of the above too – you reminded me of an interesting (and relevant) passage, I’ll see if I can get to translating it. I was told by Takeda Sensei to open my hand in the way that a Morning Glory (“Asagao”) blooms, but I think that this means to open the hand while rotating slightly. I conceived of my Aiki while thinking about this kind of thing. Not receiving the opponent’s power and making it so that their power will not enter into me when I attack is Aiki. This is not simply draining their power, you must also make an attachement. Aiki makes an attachment through the way that the hand is opened. Simply opening the hand is not Aiki. Learn Aiki through Suwari-ryote-doori Agete. This is how I learned the Aiki method of destabilization. The important Hiden (“secret transmission”) is (1) Turn the thumbs towards yourself. (2) Rotate your forearms. Because they rotate the attachment is formed. In order to rotate them, it is the same way that a Mountain Rose (“Yamabuki”) opens. Putting power into each of the fingers is important. The Gokui (“secret”) of Aiki. The reason that an attachment is formed with Aiki is because of the rotation of the forearms. Very good. I was sitting here at my computer going through the motions of tenouchi as I was taught it smiling as it reminded me so much of the feeling of doing Asagao (in a way) when done correctly. Thank you for posting these very valuable articles. I think the (unreadable) characters in the illustration are あくまで（飽迄）which would make sense from the context. Looking at it, I think that you may be right, and it does make sense – I’ll add it to the translation!